Competition for new forex client business is intense. You can stand out from the crowd with a forex marketing plan showing potential clients that your firm is trustworthy. New investors who research foreign exchange trading are likely to come across articles detailing forex scams and stories about clone firms. Those stories make many people hesitant to invest their money. Improving your website’s content and using social media is an online marketing strategy that can help your forex business succeed. Use these online marketing techniques to show potential clients that your forex firm is legitimate and reliable. Clearly list your forex brokerage’s license number and the regulatory agency with which you’re registered on your website. 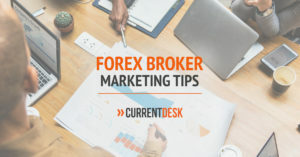 Many forex education websites tell investors to avoid forex scams by choosing a broker that is licensed by the regulating authority for that broker’s location. Listing the details of your license and registration on your website is one of the best ways to show all those potential clients that you are a broker they can trust. You could even provide a link to your regulating authority’s website or its search feature. 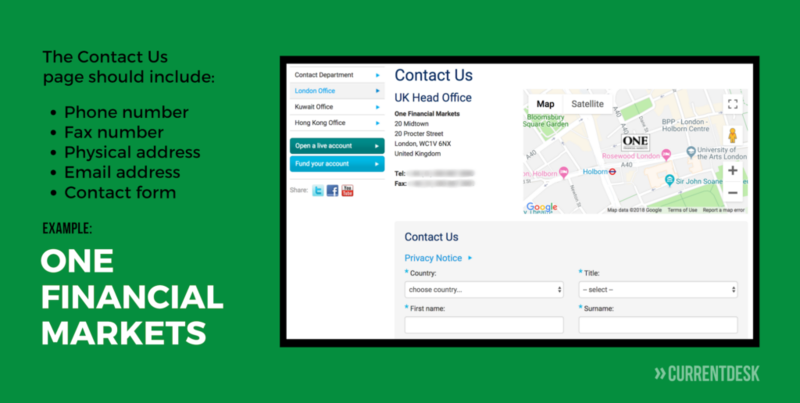 For example, if you’re an FCA regulated broker, your website could have a link to the Financial Conduct Authority’s search tool. Then, potential clients could enter your reference number in the register and confirm that you are an FCA licensed broker. 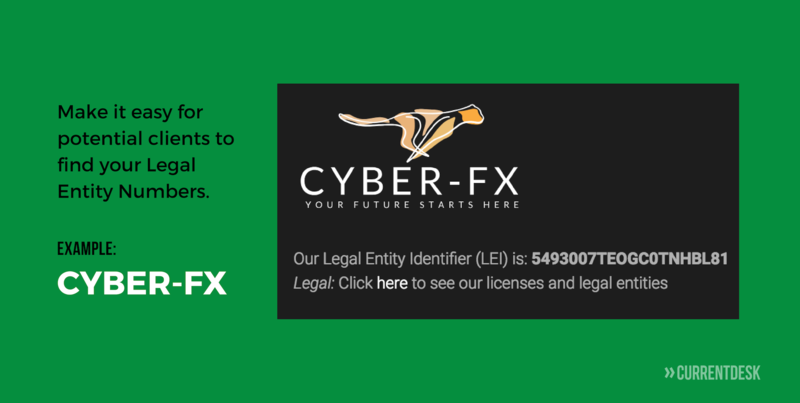 Cyber-FX does a great job at making it easy to find their legal information. It’s listed in the footer section on every page of the firm’s site. Make it easy for potential clients to get in touch with you by listing your physical address and phone number on your website. It may seem unnecessary to list a physical address since most clients will never visit your office in person, and you won’t meet most clients face to face. However, listing your address shows clients you have a real office in the area where you’re regulated. It builds credibility and helps you look legitimate. One Financial Markets Brokers does this nicely. Their Contact Us page has a contact form, but it also shows a map with their office location, lists phone numbers for different departments, and includes links for different offices. Make sure the wording on your website doesn’t over-promise the service you provide. For example, don’t exaggerate the size of your spreads or your execution speed. Although your company website is an ideal place for marketing material, you shouldn’t make it sound unrealistic. You can make positive statements about your services without making false promises. Potential forex investors will be turned off by a website that makes your business sound too good to be true. False promises can also open you up to additional chargebacks because clients will be able to claim that your service didn’t deliver what was promised. Those customers might even leave negative reviews on third-party review sites saying that your business is a scam. 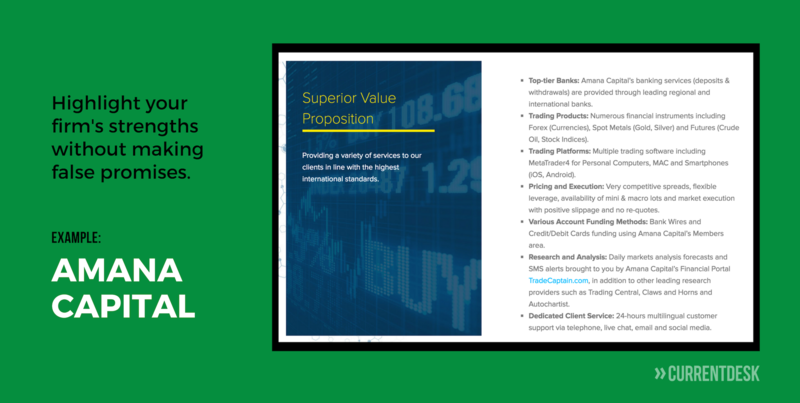 Amana Capital’s Why Choose Us? page does a great job walking the line between marketing its services as superior to competitors and sounding unrealistic. Make sure your website includes documents that help clients who have trouble with the trading platform or any of your other services. You probably don’t think of help documents, like How To articles and FAQs, as marketing materials. However, useful help documents show potential clients that your forex firm is dedicated to customer service. Put those documents in an area where non-clients can see them. Your website should also make it easy for people to find out who to contact if they have problems when they are using your services. 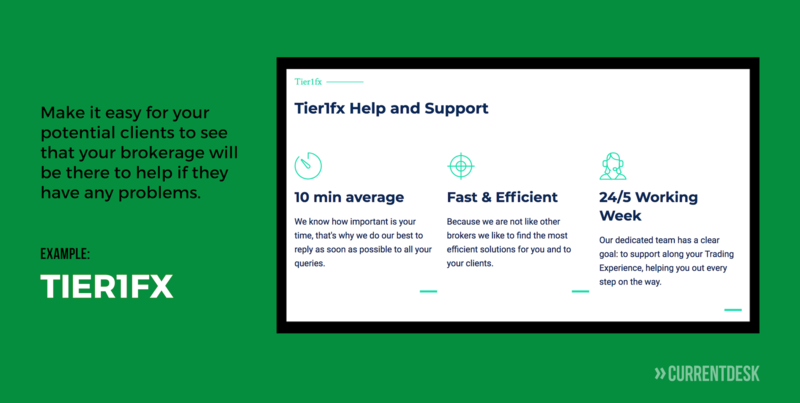 Tier1FX has a nice Contact Us page that includes details about when you can get help and how long it usually takes for a customer representative to respond. Respond to any negative reviews you find online. If a potential client finds negative reviews, you want them to see that your firm takes customer complaints seriously. Any client who has a bad experience with you, even if you did everything right, can leave negative reviews for you at many different places online. A lot of those review sites allow businesses to respond to reviews for free. Addressing negative reviews should be a part of your online forex marketing plans. Create profiles on LinkedIn and Twitter to take advantage of the benefits of social media marketing. A profile on LinkedIn will help business clients find you and enhance your legitimacy when all potential clients research your firm. You can use a Twitter profile to post news and articles that your clients might find helpful. These posts help establish your firm as a source of knowledge in the forex industry. Shift Markets, a white label forex provider, is active on Twitter, and the company has over 1,000 followers. You have many different options when it comes to online marketing, including Google ads and listings on forex broker forums. Those avenues may be useful, but the simplest and cheapest way to market your forex business online is to use your web presence to help potential clients trust you with their money. Read more about advertising for forex brokers.